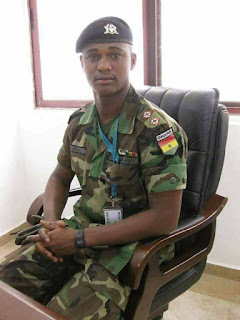 Today is exactly one year when Major Maxwell Adam Mahama stationed at Denkyira Obuasi to fight illegal mining popular known as Galamsay was killed by an angry mob who claim they mistook him for a thief. His death sparked uproar in Ghana and even led the nation to champion the pledged of the ruling NPP party to put a stop to all illegal minings in the country. His death became a major force for the call against mob action. After the incident went viral, over 50 people were arrested by the police to assist in investigations but as at it stand now, several have been released by the prosecution with about a dozen still standing trial. Well, today is one year of his death. The family of the late Major Maxwell Mahama will be observing his one-year memorial service today. Dawuroo.com wishes him "Rest In Perfect Peace"